I love ginger. I really really love ginger. Whenever someone asks me what my favorite ingredients are to cook with, ginger is always on my list. It’s amazing in desserts, and it’s amazing in Asian dishes. I even love just chopping ginger (especially so when it’s matchsticks!). Anyway, I was recently contacted by The Ginger People about sampling some of their products and reviewing them on my blog. I was happy to do so, obviously! The Ginger People have been around for 30 years, but oddly enough, I had never heard of the brand until I was contacted by them. It’s a family-owned and -operated business (which is fantastic) and they produce over 80 non-GMO ginger products, with no artificial ingredients. They also happen to be the most award-winning and top-selling ginger brand in the world! I received Ginger Syrup, Crystallised Ginger Bits, Ginger Juice and Minced Ginger (all organic!) to sample. Trying to think of what to make with all this ginger was surprisingly difficult. Not because I couldn’t think of anything, but because I thought of too many things! I eventually settled upon ginger granola, after being inspired while reading the Crystallised Ginger Bits box (the box suggested tossing some of the ginger bits into granola). But no, just some crystallised ginger bits wouldn’t be enough. A lot of granola recipes out there use maple syrup as a sweetener and to help hold the ingredients together while baking; I decided to use the Ginger Syrup instead of maple syrup, and it worked perfectly! This ginger granola recipe has a lot of amazing ingredients, actually. Oats, almonds, pecans, pumpkin seeds, millet, buckwheat groats, coconut, cinnamon plus crystallised ginger, ground ginger and ginger syrup – what’s not to love! 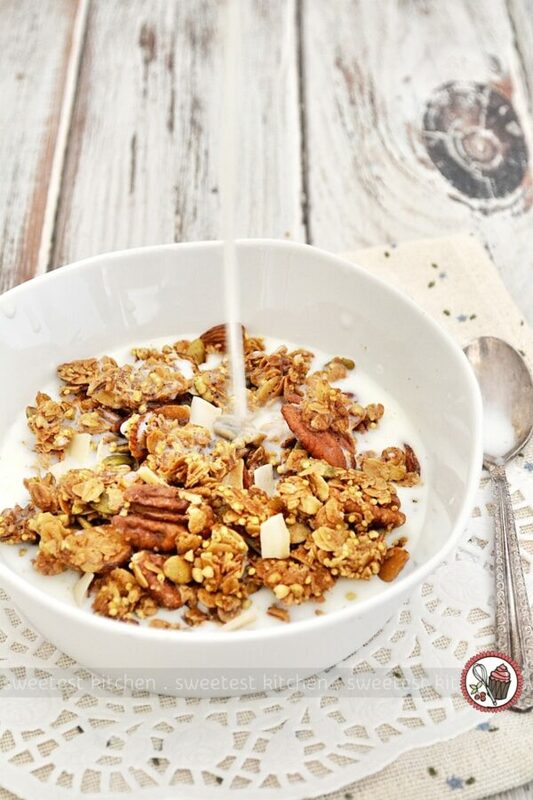 The smell of this granola while baking… wow… it’s beautiful. It’s very autumn-ish and scents the entire house with a warm gingery aroma. Honestly, I would bake this recipe just for the smell!! Despite the three different types of ginger in this granola, however, the taste wasn’t very gingery. I had thought the ginger flavor may be overpowering, but it wasn’t. The warm spiciness was definitely there, but it was subtle. 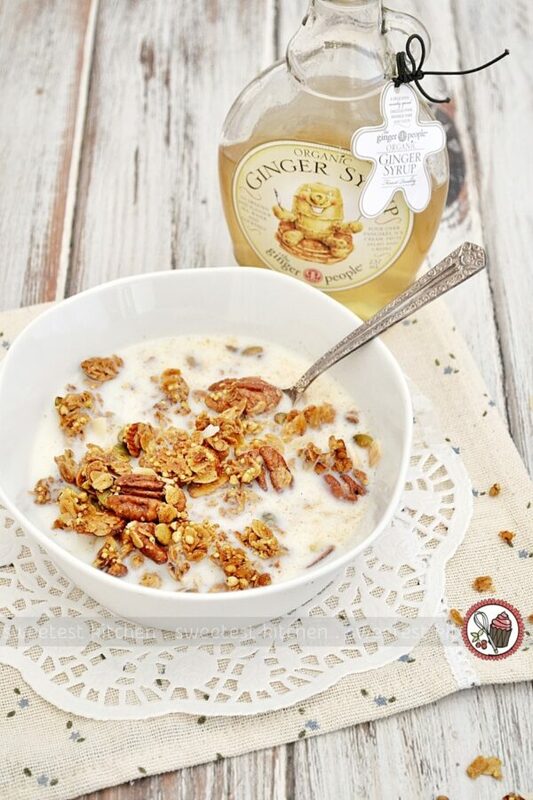 To kick up the ginger a bit, you could always drizzle the granola with a bit of the Ginger Syrup just before serving. Otherwise, it makes a lovely breakfast as is! That Ginger Syrup, by the way, is awesome. You can drizzle it on anything, like you would maple syrup. In fact, I’d even go so far as to recommend to replace any maple syrup in any recipe with this Ginger Syrup! It’s that good! And imagine that warm gingery flavor hit in your smoothies, popsicles, ice creams, whatever! If you haven’t yet tried any of The Ginger People products, you can find them at Coles, IGA and other independent supermarkets, Healthy Life, Go Vita and leading health, organic and vitamin stores, and pharmacies Australia-wide. 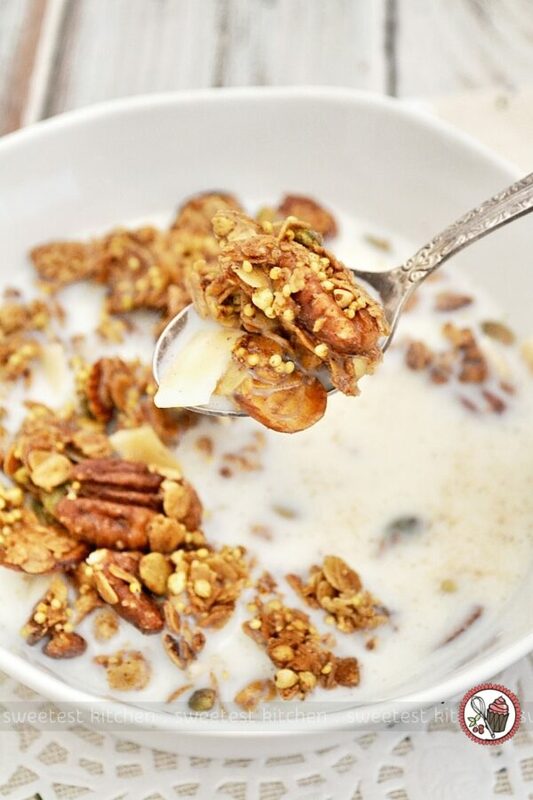 An easy recipe for ginger granola, featuring three different kinds of ginger! Perfect for breakfast or an on-the-go snack! Preheat oven to 275F (135C). Line a large baking sheet with baking paper. Set aside. In a large bowl, mix the oats, almonds, pecans, pumpkin seeds, coconut, millet, buckwheat groats, Crystallized Ginger Bits, cinnamon and ginger together. Add the melted butter and Ginger Syrup to the bowl and stir until all the dry ingredients have been thoroughly coated with the butter and syrup. Spread the granola on the baking sheet into a thin, even layer. Note, if you want clusters, make sure that the granola is somewhat stuck together; don't leave big gaps in the layer. Bake for 25 minutes, then rotate the pan. If you want clusters, DO NOT stir the granola. Bake for another 20 to 30 minutes, or until the granola is golden brown. Keep an eye on it, as it once it starts to brown, it'll go quickly. Remove from the oven and let cool on the tray for 30 minutes. 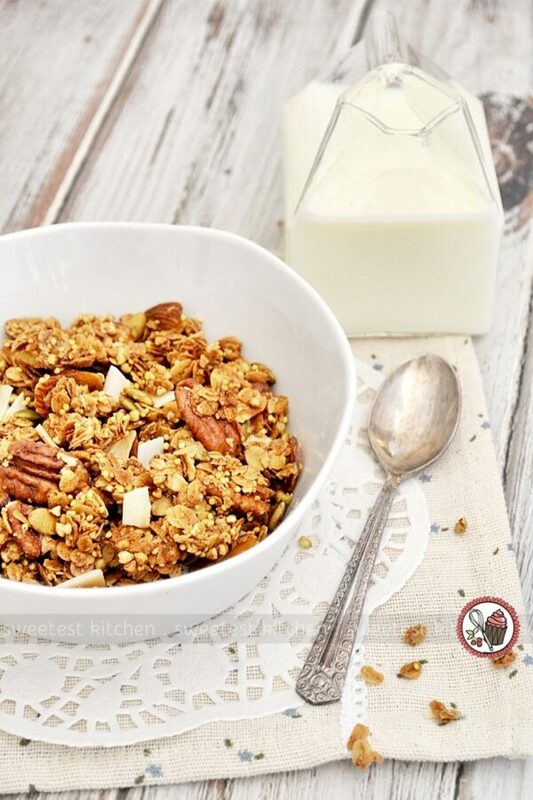 Break the granola up and enjoy it with milk, yoghurt, ice cream, or however you like! It's just as delicious as a quick, crunchy snack, too! Yummy! I used the ginger syrup a friend gave me. I didn’t have some of the ingredients on hand, so I used sunflower seeds instead of the groats & millet, and extra almonds instead of pecans. I added two beaten egg whites to make the granola “clumpy” they way I like it. I also baked at a higher temp for a shorter time because my oven is a billion years old and refuses to stay lit at very low temps. It turned out so well that I doubled the recipe the second time and bagged up the granola to give as gifts.